a Muscovite in Harold’s cloak? How does one review a work like Eugene Onegin? It’s not that I’m nervous writing about classics, but Russian novels in verse which are so important they created a genre? That’s a big ask. Nabokov wrote an entire commentary on the poem, and a famously literal translation. Where to start? Well, if there’s a point to blogging it’s to record a personal reaction. I’m frankly not qualified to speak to any technical aspects of Eugene Onegin. It’s only because I looked it up on Wikipedia that I know it’s in something called iambic tetrameter (and then I had to look up what that was). This then will not be an academic critique; it won’t be an analysis of the poem and its place in Russian literature. This is simply my reaction to a book written around 180 years ago in a language I don’t speak and in a style I’m unfamiliar with. I’m already thinking about reading it again. Back in 2010 I read Lord Byron’s Childe Harold’s Pilgrimage, written in the second decade of the nineteenth Century. I enjoyed it, but I didn’t read it for its own merits. 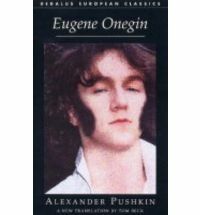 I read it because without it there wouldn’t be a Eugene Onegin. Pushkin’s Eugene Onegin is the bridge between the European romantic tradition and the later Russian concept of the “superflous man”. That makes it sound of mere historical interest, but Pushkin is far too good a writer for that. This is a delicious novel, still well worth reading. As Pushkin goes on to say, “Childe Harold-like, he was ill-humoured”. This is of course classic territory (what do you expect? It’s a classic). A bored young blade looking for some means to alleviate his ennui, even before Byron this wasn’t an unfamiliar character. Laclos would have recognised him. Coming just 15 years after Byron’s creation though the source is even more obvious. It’s a point which raises another question: if Harold was as many thought Byron’s thinly disguised autobiography, is Eugene actually Pushkin? If I hadn’t thought of the question already it would be firmly in my mind after that denial. Pushkin’s well aware that readers will be looking at this wondering if it’s really about him. His narrator, who is of course also a character within the novel, loudly denies that he’s Eugene – “we’re different fellows”. The narrator’s a garrulous sort though, and he can’t resist throwing his own comments into the text, reflecting on how Eugene’s life reflects upon his own and generally digressing. That split, between Eugene as protagonist and the narrator as meta-character, is what makes this so much fun. Eugene’s story is pretty straightforward. He leaves Moscow and goes to the country, where a young and innocent girl falls in love with him and where he becomes friends with a local poet. During his stay misunderstanding and lack of thought lead Eugene to commit to a duel which ends, as duels in Russian literature generally do, to tragic consequences. In case you don’t know the story I won’t say more, but knowing it wouldn’t harm the book any. Pushkin’s not aiming to surprise the reader with plot twists here. While all this is happening the narrator is revealing his own character. His acerbic asides reveal his own past romantic misfortune, his loss of fashion and his world-weary cynicism. As with the Tales of Belkin what at first seems to be a framing device becomes as important as what it’s framing. Pushkin, on the strength of the two books I’ve read so far anyway, is an incredibly playful writer. are not exactly all that new. All this narrative dexterity is married to a rich vein of social commentary. Pushkin’s aim is as accurate as Onegin’s, and he turns it on Russian society, on earnest Romantic poets, on the superfluous men of Eugene’s generation, even on some public figures which (as the end-notes make clear) his contemporaries would have recognised. As so often country folk come out as better than anyone else, but then the myth of the pastoral idyll is always with us (and even that is shown here as stultifyingly dull). This is the first time I’ve read Eugene Onegin, so I can’t compare Tom Beck’s translation to others. My impression is that a straight translation of Onegin is essentially impossible. The original poetry was innovative and unique, and translating it means making a choice between exactly how faithful you are to the exact meaning of the language and how faithful to the structure and style. Tom Beck is a musician by training, and that shows here in a translation which emphasises flow over precision. It’s not that he writes his own text (I did compare the opening stanza as it appears in several translations and Beck isn’t rewriting as such), but he wants to keep the poem as a poem and since direct English equivalents of the original Russian words wouldn’t fit the sructure it’s fair to say there will be translations which hew more closely to the original meanings (Nabokov of course being the most striking example). Meaning though is only part of being faithful. Beck preserves the feel of the poem, he preserves its rhythm and that too is a form of fidelity. Translating fiction is like interpreting music. Two orchestras performing the same piece will each give it their own stamp. Prokofiev’s Alexander Nevsky when performed by say the London Philharmonic becomes the London Philharmonic’s Alexander Nevsky by Prokofiev. It’s still Prokofiev, but it’s no longer purely Prokofiev. Is this then a good translation? Well, yes, because I read it and enjoyed it and I felt the movement of it and left wanting to read more. Is it the best translation? Best for whom? Is it a worthwhile translation? Yes, because fidelity to structure is no less valid than fidelity to meaning. There were occasions when I found a rhyme jarred slightly (else and ourselves for example, above) or where I lost the rhythm for a moment and had to reenter the poem. After the first few pages though I found the verse as natural as prose, and if you’re to have any hope of reading a book like this that’s critical. I’ve long been a fan of Dedalus Press, so when I saw they had their own version of Eugene Onegin I had to give it a try. I’m glad I did, and I hope others will too. This is a lively and fun book, tragic and witty and clever enough to leave many ambiguities unresolved (if the end of The Sense of an Ending left you frustrated this one really isn’t for you). Russian literature has a (undeserved) reputation for being heavy, depressing and difficult. Eugene Onegin is none of those things. Who has never cursed stationmasters? Who has never argued with them? The Tales of Belkin are made from spun sugar. They seem insubstantial, but they’re constructed with great care. There’s hardly any plot to these tales, and these aren’t the sorts of stories that have cunning or entertaining little twists at their end (there’s a bit of that, but no real surprises). These aren’t perfect miniature portraits of a person or situation either. They’re none of those things. So what are the Tales of Belkin? Well, let’s step back. What they definitely are is a collection of five short stories, published around 1830 as a single collection and accompanied by a foreword in two parts. The first part of that foreword is ostensibly written by the editor and explains who Belkin was – a collector and compiler of true tales from his neighbourhood. The second part is a letter from a friend of Belkin’s, published by consent, in which he describes Belkin and the background to his work. Of course, Belkin never existed. The foreword makes no hint of that though. We’re told that people’s names have been changed to protect those involved, but that place names have not due to Belkin’s “lack of imagination.” The whole thing is a huge joke, because what’s claimed to be essentially an unimaginative act of collation is in fact a delicate work of art. Maria Gabrielovna had been raised on French novels; it should therefore go without saying that she was in love. That quote above is typical of the Tales. There’s a wry humour shot through most of the collection that makes it a delight to read. The first story is the darkest. It’s a tale of obsession, long awaited revenge and that much overindulged Russian pasttime of duelling. 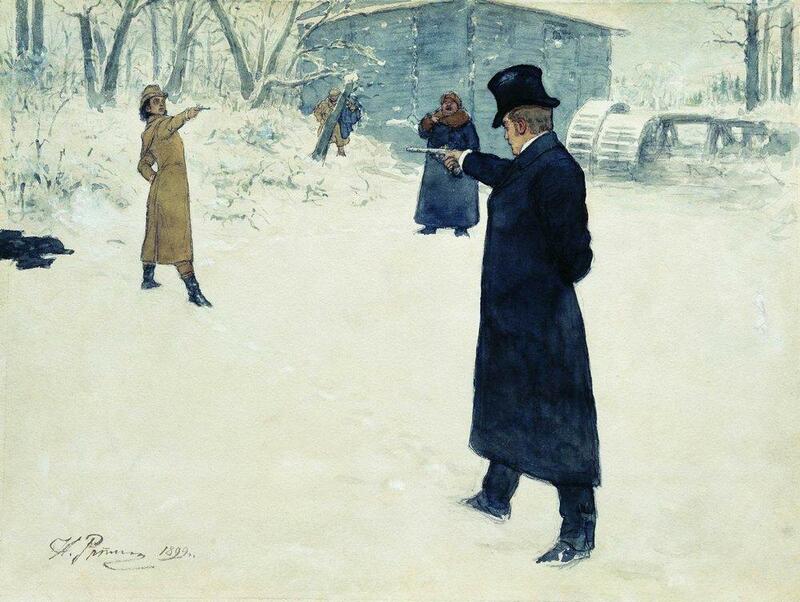 Titled The Shot, it’s an example of a classic Russian narrative of this period. He stared down my pistol, taking ripe cherries from his hat and spitting out the pits, which flew at me. His composure sapped my strength. What good was it for me, I thought, to take his life, when even he didn’t value it? After The Shot, the tales are generally much lighter in tone. In one a young couple plan to elope, but the night they arrange to meet sees a terrible blizzard which throws everything into confusion. In the next an undertaker has a vision of the dead returned to him to complain about their cut-price coffins. The penultimate story, The Station Master takes a more melancholy turn with a man losing his beautiful young daughter to a kidnapper. From there though it’s back to a comic love story between the children of two rival landowners, with one’s daughter disguising herself as a peasant girl so she can meet the son of the other. At this point I am going to deviate from the pleasing conventions of current-day novelists by describing neither the Russian caftan worn by Adrian Prohorov, nor the European outfits of Akulina and Darya. I suppose, however, that it is not inappropriate to say that both women wore yellow hats and red shoes, which they did only on special occasions. Of course despite the disclaimer (and the tale is supposedly written by Belkin who’s not a novelist at all) Pushkin has in fact given a pretty good idea of how these characters are dressed. Is he satirising those other novelists? Satirising the imaginary Belkin and his literary vanities? Both and other targets too? Throughout this collection Pushkin shows an incredibly light touch. There’s the wit I referred to above, but there’s also at times a surprising of psychological insight. It’s surprising because in humorous stories of this kind it’s unexpected, and it creates a layer of sadness alongside the comedy. [Maria’s mother] spoke with her husband and a few of the neighbors, all of whom agreed finally and in chorus that this was clearly Maria Gabrielovna’s fate, that no horse could outrun destiny, that one lived with the man and not the money, and so on – words of wisdom being remarkably handy in those moments when we need to justify our actions, but have little reason to do so. I opened by comparing these stories to spun sugar. They’re slight, frivolous even, but that’s not the whole truth because they play clever games with narrative and style. With the creation of Belkin, Pushkin makes these stories within stories. In The Shot Pushkin is writing as Belkin who heard the tale from a soldier who heard the story that is within the tale from two more men who were each involved with it. There are multiple layers of narration there, but so smoothly done I didn’t even notice it until I stopped to think about it. The Tales of Belkin then are beautifully constructed exercises in style. They are also funny, sometimes charming and generally rather clever. In fact, it wasn’t until I started writing this I realised how clever and I’ll come back to that in just a moment. After all the positive comments above, it is worth mentioning one concern I had. Generally I found the translation by Josh Billings fluid and natural. There were moments though that it jarred with me slightly. I struggled with a description of a character as “having been a real ham at one time”, which “did him no harm in the opinion of Maria Gabrielovna who (like most young women) gladly excused mischief, displays of daring, and enthusiasm.” Ham may be true to the Russian, but it’s only meaning in English I know is a bad actor, which has nothing to do with being mischievous. A reference to Russia as the “fatherland” surprised me too (though is probably accurate to the text) as did a description of a man as a “sickly old geezer” – a term which for me which brought to mind cockneys down the dog and duck rather than the Russian plains. Those complaints aside, the translation wasn’t stilted and managed to generally avoid sounding archaic or overly modern. In the end, I thoroughly enjoyed the Tales of Belkin and while one or two choices of language might have jarred Josh Billings must be owed some thanks for that. When I started writing this blog entry I could see no connection between these stories. I was missing the obvious. Belkin is the connection. He’s the only character who appears in each one, with direct asides to the reader and with the structure of the tale being a structure Belkin has chosen. The cleverest thing with the Tales of Belkin is that they are just what they say they are, tales of Belkin, even though he is apparently in none of them. I’m going to have to reread them. Like spun sugar, there’s more substance there than you’d think at first glance. Tales of Belkin. I bought Tales of Belkin because of a competition at The Asylum blog in which a copy was among the prizes. I didn’t win but decided to get the book anyway. John asked for a linkback from anyone who ended up reading it, so here it is.